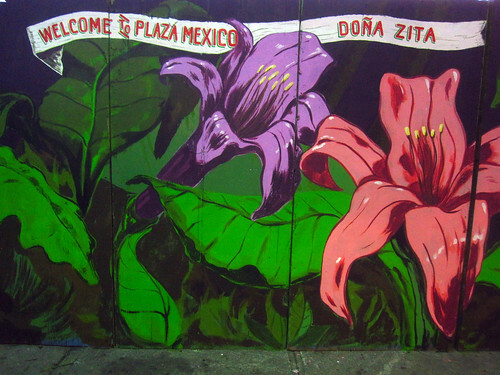 Last summer, street artists OverUnder and ND’A painted murals for the restaurant Plaza Mexico Doña Zita on the Bowery and Henderson Walk in Coney Island. 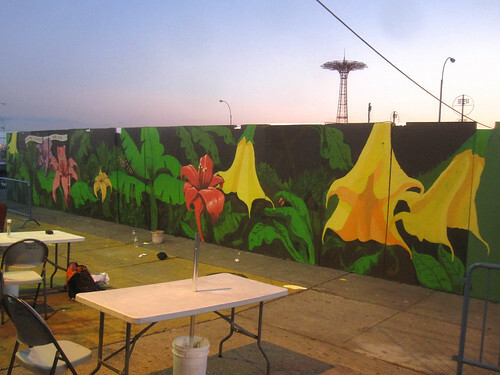 Giant tropical flowers blossomed on a fence on the Henderson side of Thor Equities’ construction site and brought a garden of street art to Doña Zita’s. Unlike some of its neighbors, this popular little eatery has managed to survive the upheaval brought about by Coney Island’s rezoning and redevelopment. Yet Doña Zita’s proximity to Thor’s empty lots made the seating area less than scenic. Then the murals appeared, almost miraculously, and transformed the view. Since construction on Thor’s building is completed and the fencing was taken down, the Doña Zita murals have been piled up in the lot across the street, awaiting their fate. Murals from the Bowery, Surf and Stillwell sides of the building, which were painted by OverUnder, ND’A, Veng, Radical and Ephameron for a project curated by Keith Schweitzer for No Longer Empty, have already disappeared. Last month, some panels were spotted in a botched reassembly at another Thor construction site in Bensonhurst. Do street artists have a tough skin when it comes to the fate of their work? ATZ contacted the No Longer Empty muralists to find out. At the same time, OverUnder and the other artists are sad to see colorful, handmade, authentic signage of Coney Island replaced by pre-fab or generic signs. Thor Equities new building remains vacant and is now encased in plywood except for the side on Henderson Walk, which is the back of the building and has no windows. “I see a blank canvas for No Longer Empty,” wrote one of the commenters on our recent post about the building. We’d like to see more murals too, but Thor is already throwing up advertisements. This week, signs touting “CONEY ISLAND – The RETAIL RIDE of a LIFETIME – for leasing contact..” went up on the Stillwell side. Thor debuted the odious slogan last May. 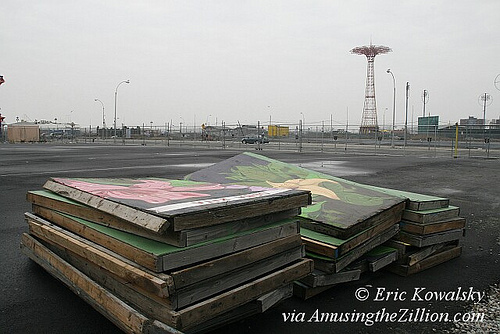 Doña Zita’s is located on Coney Island’s Bowery at Henderson Walk, one of the few historic “walks” remaining in Coney. We love her food and so did the artists. The restaurant also gets high marks on Yelp, Serious Eats (“Tacos plus sandy feet and the smell of the ocean equals the perfect summer combination”) and Time Out (“the finest quesadilla this side of Sunset Park”).